Unity has reaffirmed its aim to provide its 3D gaming engine to as many platforms as possible. At Microsoft’s BUILD conference a strategic partnership was announced that will see the game engine be supported on the Xbox 360, Xbox One, in Windows Store Apps and on Windows Phone 8. 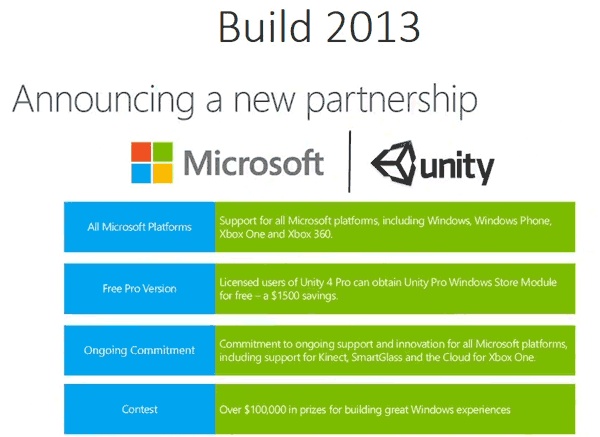 Beyond the developer support for these platforms, Unity will provide free Pro publishing tools for Windows Store apps and Windows Phone 8. An official post on the Unity blog page announced; “Today at Microsoft’s annual Build conference, a strategic partnership was announced between Unity and Microsoft.” On the subject of the perks for developers of Microsoft’s platforms; “That means support for their rather badass upcoming Xbox One and much more. I’m also happy to say that the Windows Store Pro publishing add-on will be free when released (soon). So all current and future Unity Pro 4 customers stand to get $3000 worth of tech at half price!” It was spelled out that this means “your games, ads, training and educational apps―any kind of Unity-authored content” will all be portable to Windows Store and Windows Phone with a Unity Pro 4 license. This is hoped to result in more developers pushing their games onto Windows Store and Phone platforms. Unity announced support for the Sony PlayStation 4 earlier in the year. Unity supports many major gaming platforms including iOS and Android, the PS3 and Wii U. On its website the company claims that “Publishing a build for any platform is near-seamless. When you are ready to publish, simply select a Platform. Press the build button, Save your game, and Unity builds it. Yep, it’s that simple.” A showcase list of games powered by Unity is available on the Unity website here. Mono-based engine on Microsoft hardware. I think it's a lot more lolz that the .NET Framework is a major multi-platform gaming force. Microsoft has really done a good job there.